Let’s just start this post off with the happy truth: I’m most definitely NOT giving up sugar for my birthday. My so-called sugar fast has been going great (it’s not even an actual sugar fast, just a buying-candy fast). I started it back in mid-April and have only bought candy twice since then. If you are my friend Taryn or if you’ve known me for more than, like, five minutes, you recognize this as a tremendous improvement. I love candy so much and was known to be crazy obsessed with it at times. But I’ve been much better about it. Occasionally I get a few pieces of candy from someone (such as my boss at our monthly faculty meetings), but overall I have been avoiding it. Out of sight, out of mind. Out of my house, stays out of my tummy. So here I am to say that this week, I’m taking a little hiatus from my candy-purchasing embargo. My birthday is this Tuesday, so I’m going to be a little extra indulgent towards my sweet tooth. Some say that’s one of the keys to sticking with many diet or lifestyle changes–allow yourself the occasional controlled “cheat” day or meal, and then keeping to your improved lifestyle will be much easier. Thank you to the Foreign Candy Company for supplying my school’s foreign-language club with Bon-Bons, these delightful little chewy fruit candies that the students just go nuts over. They arrived on Friday, just in time for my birthday week, and yep, I broke my rule that day to get myself a bag of strawberry-flavored treats! I honestly worried that they might sell out by midweek, as popular as they are with the kids here. That package was tasty, and I don’t feel the need to stock up on bags and bags of it or anything. 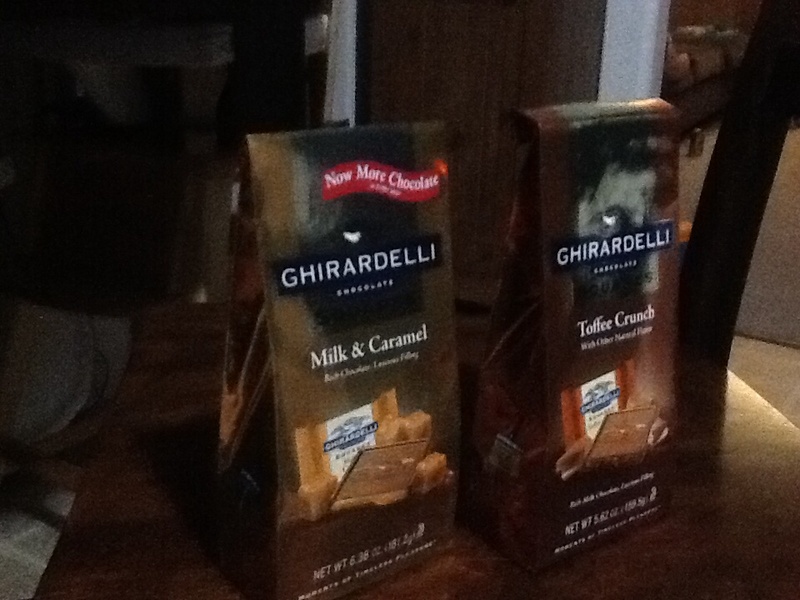 Anyway, I am looking forward to enjoying a little break from my rule, and just enjoyed a delectable Ghirardelli chocolate…mmm! I will gladly return to abstaining from candy-buying by the end of this week, though. (My hubby asked, only partly in jest, if I’m also going to drop my rule for Halloween week, Thanksgiving week, Christmas, etc.). Ha! Nope! I really don’t think I will. Maybe once a month I’ll give myself a free pass, but no more than that. I’m excited by how much less I crave the stuff compared to before, and how much more I savor the candy treats I get now that they’re so much rarer. Now, they are an actual treat! Plus, once the other school-group candy fundraisers begin, I have an excuse for saying no! Good luck to you with whatever your goals may be, readers. Keep on pluggin’ away! So the no-buying-candy streak lasted nearly two full months. It began April 17 and ended today. Not bad, right? Fifty-three days without incident, as my sign would read if my resolution were a factory or something involving dangerous machinery. Although, come to think of it, a mere fifty-three days wouldn’t inspire that much confidence if I were a prospective employee at said factory. But I digress. What triggered the slip-up? Super crazy exhausted stressful driving! My baby boy and I were heading home from my great-uncle’s memorial service only to discover that anywhere we needed to go was fraught with delays and detours. Ugh. After almost two hours of stalled traffic, missed turns, unclear street signs, lack of GPS, and a slightly crabby toddler in the backseat, I did finally break down (not literally with the car or anything) and buy a package of gummy bears at the Walgreen’s where I asked for directions. Even though I was finally getting close to where I needed to be, my tension level was so high, I just didn’t care much about my rule at that particular moment. We can’t let temporary slip-ups derail the whole experiment. We acknowledge the mistake and move on with fresh resolve. 1) I definitely have been eating MUCH less candy during this time. The only times I’ve indulged were at a few get-togethers, including my cousin’s baby shower this past weekend. 2) The candy I’ve had has seemed more of a treat. Exactly as it should! Not an everyday thing. 3) Sort of contradictory to #2, I don’t enjoy candy the way I used to. I’m not giving up sugar by any means, but I’m finding that my tastes lean more toward baked treats, anything made from REAL ingredients. I tried making chocolate mousse out of nothing but avocado, cocoa powder, and honey that was ahh-mazing! I love my cookies and enjoy them much more than fake-tasting candy. The gummy bears I ate today were completely unsatisfying and made me feel sick. So actually, this was a productive end-of-streak; it reminded me of how much better real food tastes and strengthened my resolve for the next several months. Bummer to have to start the count over again, but such is life. I’m feeling pretty darn good about my fifty-three days. How about you? What’s the tally for you and your specific goals? I’m stuck. Only five days into NaBloPoMo and I am already anxious about what to write next. Too many subjects floating around in my brain. Travel. Christian community. Teaching. Running. Parenting. Family. Music. How do I decide which ones to pursue? This month is largely about finding my voice and my passion, so maybe it’s okay if I try all of these topics at one point or another. Another problem: I’ve been reading other blogs that interest me and that triggers the evil comparison game. These people all write more creatively, more poignantly, about more exciting issues than I do. Surely someone else has already said what I’m going to say, and they’ve probably said it better. I wonder, why bother? I feel paralyzed by my feelings of inadequacy, my lack of vision, my fear of failure. Is there anything I can bring to this online community of readers, writers, and thinkers? Is it worth it, even if what I have to say is ordinary? Even if it’s all been said before? As King Solomon noted, “everything is meaningless–like chasing the wind.” (Ecclesiastes 2:17). This blog-a-day endeavor will have its high and low points, and I’m going to persevere. Although “writing books is endless, and much study wears you out” (Eccl. 12:12), I think there is value in this goal. There’s value in setting out to do something and following through. Considering my most recent post was on unfinished business, I have an obligation to myself to complete this task. So if you’re reading this, I hope you’ll be patient with my fumbling attempts at transparency and truth. I hope you’ll extend me a little grace as I figure it out. 1. At least four or five novels that I began writing and never finished. This includes a collaborative book project with my best friend. It’s a chick-lit story of first-year teachers. We started it maybe four years ago, working together occasionally in our free time, drawing from many of our personal experiences. We even attended a writers’ conference to take classes on writing and the publishing process. However, life got busier and busier, and now I can’t even remember the last time we wrote anything new. ( Sorry, Taryn!). Our book is in limbo, stuck at 78 pages and 42,000 words. Our poor lead character is also suffering, waiting and hoping for her life to get straightened out. 2. Various paint touch-ups that need to be done all over my house. Every room we repainted when we moved in needs help. And no matter how carefully I applied painters’ tape to protect the corners and edges, there are still smudges galore. I guess I never learned in kindergarten how to stay inside the lines. 3. Ordering the additional classroom supplies and texts I’ll need to get through the school year. Our department has a budget, and I love school-supply shopping so much, I stretch it out and take my time perusing the options, trying to make the most of every dollar. (Review games? Cultural projects? Posters? Rewards? Books? So many choices!) Anything crucial I forget now, I’ll be paying for from my own pocket. It is November 4th. With any luck, I’ll have everything I need by April. 4. Figuring out how to attach the photos of my baby I had arranged in a collage frame so they won’t all fall down again. It’s resting against the wall of our hallway as I write, and has been there for weeks. Three and a half of the eight pictures are partially visible, while the other four spaces sit sad and empty. 6. Picking up the phone to call the dentist regarding a filling, phone company about switching service, electrician about our flickering lights, a doctor to schedule a consult for Nate’s knee, eye doctor for a yearly checkup…I hate phone calls. I would probably never get take-out pizza if it weren’t for online ordering. 7. Taking old clothes to the donation bin. I’ve held onto them for weeks, debating whether I ought to just save them for a garage sale instead. In all likelihood, if I decide that, June will arrive and I’ll be too busy. Then July will be too hot. Then August will hit, school will start and I won’t have the slightest desire to spend my free time sorting and pricing a bunch of junk and then trying to attract garage-salers and convince them to give me money in exchange for said junk. Why do I torture myself over these unfinished things? Wouldn’t it be so much easier to just DO what needs to be done, right away, without all this procrastination? It’d be so much less stressful, yet I continue to quit in the middle, or sometimes not even start. How about you? What task are you putting off today? What would it take for you to finally cross that off your to-do list?